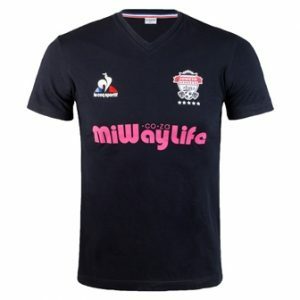 Win a Le coq sportif V Neck Tee shirt worth R399. Le coq sportif introduces game changing soccer kit. Le coq sportif has always been at the forefront of advances in sportswear. With experience that exceeds a century, it is no surprise that lecoq sportif is synonymous with quality aesthetic. Founded 135 years ago, in 1882, in Romilly sur-Seine near Troyes, France’s knitwear capital, Le coq sportif’s earliest purpose was providing high quality sport products for teams and individual athletes. Today, our textile production comes from France, where products are enhanced by high –quality materials, careful cuts, and meticulously chosen colours which is recognized by the LCS consumer and athletes. The latest edition to the le coq sportif range is the introduction of their revolutionary soccer kit, and the lucky recipients are well deserving. Le coq sportif has decided to collaborate with locally celebrated football team, Soweto Stars. Internationally sourced and designed, quality and objectives were not compromised. And it truly is unlike any other football kit. 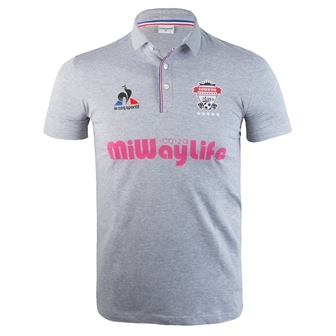 Le coq sportif Polo Cotton Jersey worth R699 to be won, including a pair of socks and a mini ball. Taking into consideration every possible element that would affect the player, as well as the game, the kit is able to allow the wearer to perform at their optimum level. The unique weave design means that the fabric is breathable allowing the athlete’s skin to be cooled as they play. It also allows moisture from the skin to be quickly evaporated which allows for maximum comfort and performance. Added stretch means that the player is not restricted or prohibited from executing challenging moves on the field. Not straying from their unique heritage, this red and blue kit (with the recognisable logo on the right) rings true to the le coq sportif aesthetic. Goal keepers are easily identifiable in grey and yellow. However, the collaboration does not halt at the kit sponsorship. Through aligning with an aspirational brand like le coq sportif, there are also plans to host community activations which will help grow the stance of Soweto Stars amongst the approximately 4 million residents of Soweto. And the players aren’t the only ones who will be lucky enough to be adorned in the latest collection, as le coq sportif is introducing a club supporters range which will be available in local stores from mid-February. Le coq sportif has once again proved that they hold the highest regard for their athletes and fans alike. Le Coq Sportif and SLM are giving away Polo Cotton Jersey- worth (R699) and a Tee Shirt Single V Neck worth (R399), including a pair of socks and a mini soccer ball to each winner. *What is the name of the football team that le coq sportif has partnered with? *Where and when was Le coq sportif found? Send name (email address), contacts and answer to info@sowetolifemag.co.za or Sydney@sowetolifemag.co.za on or before March 05 2018. All entrants must be South African residents. The prize cannot be exchanged for any other le coq sportif apparel/ footwear or money.